Sugar and Coconut Oil Cleansers gently lift and remove everyday environmental pollutants without removing hair’s natural oils. Rich in vitamins A and C, calcium and magnesium, Organic Red Raspberry Leaf Extract strengthens hair and imparts a natural shine. Directions: After wetting hair, massage a small amount in to create a lather. Rinse well. Repeat as necessary. Great smelling shampoo. leaves hair shiny and so soft! Our favorite. My daughter and I each used it once so far, but we both loved it. Left our hair smooth, sleek and smelling wonderful. Will probably buy it again. the conditioner that goes with this product to see if it would give me more shine. Thick and luscious, only a small amount will suffice. It really smells good enough to eat, and lathers up well. I bought it because I really liked the scent. I didn't expect my hair to feel so soft and shiny. I didn't use conditioner I imagine my hair would look even better if I used both. I have thick long hair that usually takes forever to brush. One of my favourite shampoos - cruelty free, good ingredients. I love the smell and what it does to my hair. I'm on my second bottle already! It works as advertised: my hair is definitely shinier and a bit straighter, even though it still has a mind of its own in humid weather. I took one star away because it does leave my hair a bit drier than I hoped, and I find it fairly difficult to get a nice lather (as with other Desert Essence shampoos), but still a great product! I look forward to trying the conditioner.. This is one of my all - time favourite shampoos and conditioners. I love raspberries and love the smell ! My hair feels quite luscious after I use it. I love this shampoo and conditioner. It leaves my hair soft and shiny. I love the smell! Yum! I've been using it for about a year. I tried switching to another brand once but switched back to Desert Essence. This is my favourite of this brand of shampoo. I've also tried the Apple & Ginger and the Lemon Tea Tree. This one cleans my hair without any residue. I only have to wash my hair every second day with this shampoo. It also lathers fairly well. I've been using it for about a year and a half now and I still love it. I love this shampoo. I've been using Desert Essence shampoo for over a year now. I did try their other shampoos, but this is my favourite. I find it cleans my hair really well, including removing residue from hair products, but does not dry my hair out. My hair is super soft. It doesn't have a very strong smell - I don't smell the shampoo in my hair after getting out of the shower, which I consider to be a good thing. And it lathers really well. A little bit goes a long way. Not bad, I suppose. I have tried the unscented version of this raspberry shampoo too, and I've not found that either give a particularly good 'clean' feeling. I have very, very short hair, and even so, I don't find that this shampoo makes my scalp feel clean. It does smell very lovely, if you like a fruity scent, which I do. (And it's a smell that's noticable in the shower, but doesn't linger on your hair afterwards.) I would buy the raspberry conditioner again, but not the shampoo. It smells really good and not overpowering, it's a gentle cleanser and I've had many good hair days since using this! Only downside: unlike many SLS free shampoos, it doesn't have coco betaine in it, which means it can't wash away build-up from hair products, so I'll have to clarify by other means. Smells great and left my hair shiny! A nice shampoo and only scored a 3 on EWG's cosmetics database. Very nice light fruity fragrance and good lather. Used the shampoo and conditioner together and it was a bit heavy for my thin hair so next time will try another type from this company. liking this shampoo a lot. doesn't weigh my hair down. Love, love, love this shampoo and conditioner. It smells amazing. It doesn't leave residue in my hair. I love that it's natural and still cleans my hair well. Also helps add shine. Would buy again!! This shampoo lathers up nicely for a natural product. It makes my hair squeaky clean and feels great. I haven't used the conditioner yet, but I'm going to get it and see how they work together. Gentle and doesn't leave a build up on my short fine hair. Great fragrance and leaves my hair shiny. I'll use it again. smells amazing & works so great on my hair. Love that its natural! Very nice and very nice smelling. Leaves my hair a bit dry, so good for people with natural hair to oily. This shampoo really surprised me! I had only purchased it along with its conditioner when it was on sale at my local grocery store. I liked the scent and decided to just go for it. After using it twice I was already getting compliments on how soft my hair looked. It also helps keep my usually wavy hair straight and looking like I had straightened it but that could also be the work of the conditioner. Make sure you get them together! this shampoo smells great and lathers up nicely. love it. Truly leaves the hair shinier than most shampoos. The smell is wonderful. The hair comes really clean and allows natural curls to emerge. I really like this shampoo. Works into a nice lather. Smells Heavenly! I just tried this for the first time and I love it! It's smells great and keeps your hair shiny. This product has a nice fragrance and makes your hair shine. This stuff works great! It's very gentle, doesn't make my scalp itchy like the non-natural shampoos. Smells good, lathers nice. 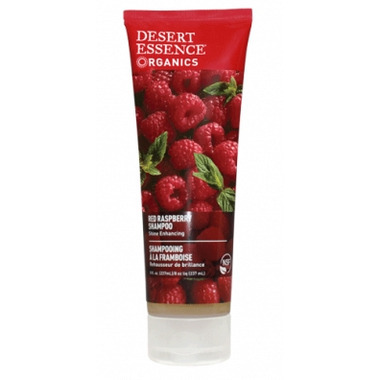 I have used the Desert Essence green apple shampoo as well, and the raspberry definitely gives more shine, so it's doing what it claims!